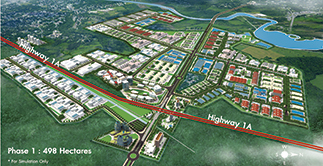 WHA Industrial Zone 1 – Nghe An, in Nghe An province, Vietnam, is an initial project in Vietnam. It brings decades of award winning infrastructure and environmental experience Thailand. The new industrial zone development represents opportunities for manufacturers, distributors and investors to grow in Vietnam and the South-East Asia region. Nghe An province boasts a prime location in the heart of the North Central Region for major manufacturers and investors. With Vinh as the city, Nghe An is the center of economic and culture in the North Central Region with the complete logistics system of rail, road, ports and international airport. Special tax incentives with full support from Nghe An government are granted by Dong Nam Economic Zone. WHA Industrial Zone 1 - Nghe An is currently drawing both local and foreign direct investment, as a strategic manufacturing hub in Vietnam, attracting extensive development. Various sizes of developed land plots with standard soil compaction control. Well-designed infrastructure and utilities including industrial water, storm drainage, wastewater treatment, flood protection and communication systems. Environmental monitoring and controlling by professional industrial zone operations and management team. "WHA industrial zone 1 - nghe an, vietnam"
Copyright © 2017 WHA INDUSTRIAL MANAGEMENT SERVICES VIETNAM COMPANY LIMITED. All rights reserved. WHA INDUSTRIAL MANAGEMENT SERVICES VIETNAM COMPANY LIMITED .